"Alu Baigan is a West Indian curry made with potato and eggplant which is served with roti or rice and kadhri. You can improvise with the ingredients if you are missing some; it tastes great even with just a few spices and hot pepper! I like my eggplant to be completely mushy." Fill a large bowl with cold water. Cut the eggplant into 3/4 inch cubes, and immediately place into the water to keep from turning brown. Pour the oil and mustard seeds into a pot, and place over medium heat. Cook until the seeds begin to pop, being careful not to burn. Stir in the onion, and cook until tender. Sprinkle in the chili powder, turmeric, cumin, coriander, garlic, ginger, garam masala, and caraway seed; cook for a minute or two to release the flavor. Drain the eggplant, add it to the pot, and fry it for a few minutes. Pour in the potatoes, and soy sauce, then add enough water to cover. Turn the heat to high, bring to a boil, then turn heat to low and simmer for approximately 30 minutes until potatoes have cooked. This delicious Indian vegetarian stew is easy to make and full of flavor. I saved the dish eventually, but I had to doctor it soo much, it wasn't recognizable from the original recipe. Sorry, but I'll find another recipe next time. Loved it! I used the small Indian eggplants. I served this to Indian guests and was told that the flavor tasted very authentic. Try it! 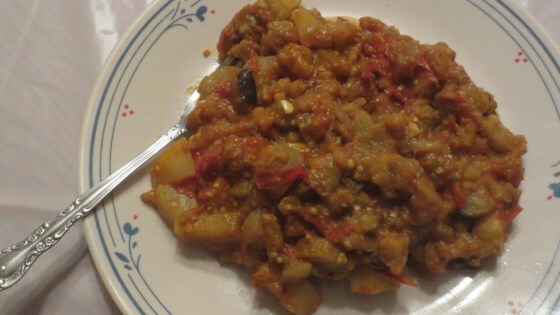 This recipe has great flavors, but the eggplant gets very squishy, giving the dish a weird texture. We're having trouble getting ourselves to eat the leftovers. Great dish! I didn't have mustard seeds or caraway seeds at hand, but it still turned out great. Will definitely make it again, perhaps without potatoes.